The Alpha Alpha Chapter prides herself on the many accomplishments she has achieved. Our campus philanthropy supports UGA Miracle to benefit Children's Healthcare of Atlanta. From hosting Meal on the Lawn, to Dancing for 24 hours at Dance Marathon, we LOVE the KIDS! This past year, we raised $187,214 for Children's Miracle Network Hospitals! 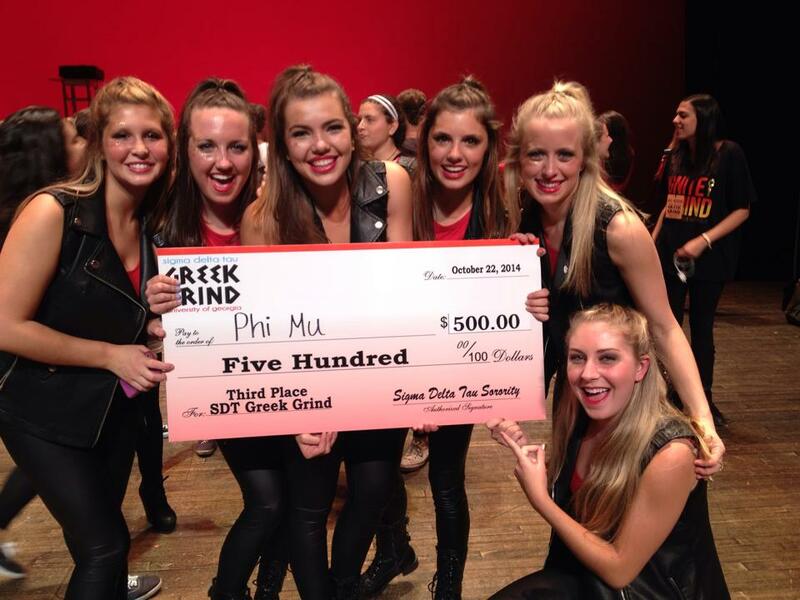 Phi Mu enthusiastically surpassed the fundraising goal. Alpha Alpha is honored to be recognized as the highest fundraising chapter in the nation, amongst all Phi Mu chapters. Each year we not only gain passion, but also enthusiasm to this special cause! Apart from Children's Miracle Network Hospitals, you can find members devoting their time to organizations such as Extra Special People, the Boys and Girls Club, Whatever It Takes, and UGA Special Olympics. In addition, a large number of our members serve as mentors and tutors to local elementary school students. We enjoy to opportunity to give back to the Athens Community through our service! This past year, we invited our friends and family to a "Southern Comfort" Meal on the Lawn. Our event included delicious chicken fingers and other home-cooked goodies. We also had live music perform on our front porch! It was a successful evening FTK! Each year, we look forward to participating in UGA Mircale's Dance Marathon. The annual 24 hour fundraiser is an opportunity for the UGA Community to rally together to support Children's Miracle Network Hospitals. Our girls cherish the opportunity to spend time with their own pledge class as well as the other members of Alpha Alpha! One of the greatest aspects of our philanthropy is the notable relationships that our members create with the children of Children's Miracle Network Hospitals. Our Philanthropy Chair works endlessly to ensure that our members have opportunities to connect with the kids! Each year, we have a family from UGA Miracle speak at our chapter meeting. This is a wonderful opportunity for our members to hear some of the personal stories of our Miracle Families. We are so fortunate to support a philanthropy that provides numerous opportunities to engage with the kids! We are so thankful that our children's hospital is located in Atlanta, which is not too far from us. On a free Sunday each semester, girls carpool to Children's Healthcare of Atlanta to spend time with the kids in "The Zone!" We bring candy, arts & crafts, and games to enjoy with the kids. In addition to our own philanthropy, Phi Mu actively supports the philanthropies of other organizations on campus. Each year, we participate in SDT Greek Grind, a dance competition between the sororities at UGA, which raises money for Prevent Child Abuse America. In 2014, we placed 3rd among all sororities and were awarded $500 towards our own philanthropy! In 2016, we placed 3rd among all sororities in the Spirit competition and were awarded $300! We love to dance for a cause.